Monday, Tuesday: 10 a.m. to 4 p.m.
Wednesday: 11 a.m. to 4 p.m.
Thursday, Friday: 10 a.m. to 4 p.m. Opening hours are subject to additional services and recitals. To check opening hours contact the Parish Office. The Friends of Waltham Abbey Church Visitors’ Centre (situated in the Lady Chapel) is open throughout the day. The Short Guide – a free, illustrated leaflet outlining the history of the church and drawing attention to the significant features. The Church Guidebook – includes a history of the Abbey Church and a walk around the interior with a floorplan and many photographs. Both the Short Guide and the Church Guidebook are available from the welcome desk at the entrance to the church. Vigorously stylised composition and figure design, and its glow of colour is amongst the best glass done in the 19thC. Sir Nikolaus Pevsner, commenting on the Burne-Jones designed east windows (The Buildings of England- County of Essex). Burne-Jones finest work, the huge wheel window at Waltham Abbey is an explosion of illuminated colour, nature paying homage to the creation and embodying the cry ‘let there be light.’ Simon Jenkins. (England’s Thousand Best Churches). At Waltham, High Victorian & Romanesque meet & compete on terms of heroic equality. J. Mordaunt Crook. (William Burges and the high Victorian dream). We offer a warm invitation and welcome to groups and associations to visit our church. Our dedicated and informed tour guides will be delighted to tell you about our history and show you round both inside and outside the church. The statue of King Harold and the memorial stone dedicated to our last Saxon king are not to be missed. Thank you for hosting and guiding us so well and interestingly yesterday. Everyone enjoyed Waltham Abbey very much and your excellent guiding helped us to appreciate and understand your wonderful building. Friends of Kent Churches. These are just a few lines to thank you for all your help in providing my Group yesterday with such an enjoyable visit. Everyone greatly appreciated your introductory talk about the Abbey Church, benefiting so much from the additional information you gave as we undertook the tour of the building under your guidance. The history of Waltham Abbey is fascinating, as indeed is the architecture of the church plus the wealth of the many historical objects about which you commented. Dengie & District U3A Local History Group. Thank you for arranging yesterday’s tour of the Abbey. Please pass our thanks to our guide for her most interesting and comprehensive tour of your magnificent church. Canterbury U3A. Thank you so much for arranging our MU branch tour of Waltham Abbey. We learnt so much about the Abbey’s history & its many treasures. It is such a beautiful building. Please pass on our thanks to our guide. He gave us so much relevant information in a very informal & friendly way. Also the lady in the gift shop who was most welcoming. All Saints’ Hertford, Mothers ’Union. Thank you so much for your time, energy and enthusiasm yesterday! We all learnt a great deal, including those who had visited Waltham Abbey before but never had the opportunity of a guided tour. I hope we were not too demanding as an audience, and I’m very grateful to the church staff for keeping the building open long enough for us to see everything. Guides Committee, Cathedral and Abbey Church of St. Alban. For further information or to book a guided tour, contact the Parish Office. We look forward to seeing you. 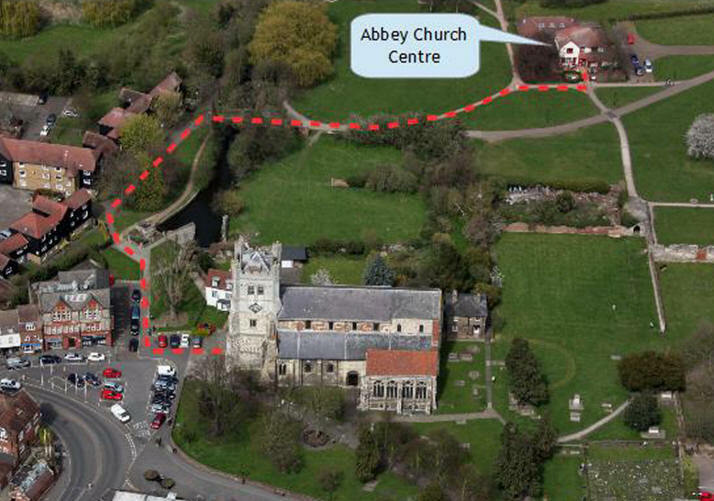 Car parking is available outside the Abbey Church – free for two hours. Or park in the Cornmill car park behind the Dé Mango restaurant, or in the Abbey Gardens car park (accessible from the roundabout on the B194 at the junction of Abbey View and Crooked Mile). the Tallis Room, a small meeting room. The Olive Branch, hall and Tallis Room are used for church events and by church organisations and may also be hired by organisations and individuals outside the church via the Parish Office. The Centre was formally the Information Centre for the Lee Valley Regional Park Authority and the Authority’s Youth and Schools Service still leases two rooms on the first floor of the building for administrative purposes and hire the hall for their educational activities. From the west door of the church (main entrance), take the small road to the right beside Henry Ward estate agents. At the end, continue on the footpath and bear to the left onto the service road. Follow this road to the right between the flats on your left and the river on your right. After a short distance, turn right to cross the bridge into the Abbey Gardens through the ruins of a gateway. Then go straight ahead following the path and taking the left branch. You will see the Abbey Church Centre ahead of you.